Registration: Upon arrival, please check in at the registration area to check in and shake hands with Chamber staff. - Upper Tier Members - Included in Dues Pymt, Registration is still required to attend event. - All other Members - Only $10 per person! Come join us for fun, informal networking at this month’s Business After Hours! 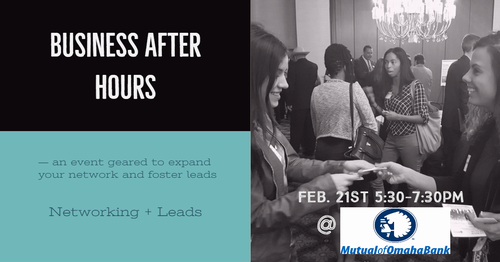 This month, we are very excited to announce that our Business After Hours is being hosted by Mutual of Omaha Bank in Fort Worth. Come join us at their location, just off of Camp Bowie! The event space holds over 200 people - so everyone is welcome!! Bring your business cards and get ready to mingle with the Mutual of Omaha staff and other Chamber Investors, while enjoying the sociable atmosphere. During the event, please enjoy delicious bites from Z’s Café and complimentary beer and wine! Make sure you check in at the Registration table, pick up your name badge (which is your ticket into the event). By the end of the event, you will have built connections, and grown your network. To top off the evening, there will be swag bags for each attendee and door prizes from Mutual of Omaha Bank and The Chamber! Do not miss out on our first Business After Hours event of the year! It is going to be a hit! !